Members of the Adivasi community say that their ancestors used to perform rituals in Sabarimala until they were forcibly removed in the 19th century by the Pandalam kings. Who does a temple belong to? Who has the right to decide the workings of a temple? As the battle over women’s entry into Sabarimala rages following the Supreme Court verdict of September 28, several questions have been raised over whether the Pandalam royal family and the Thazhamon Madom family – popularly referred to as the thantri family – have the right to decide to shut the temple if women enter. And amidst these debates about Brahminical beliefs and rituals in the temple, another, much older claim has surfaced. The Mala Araya – an Adivasi community – have said that till the Pandalam kings came into the region, the Sabarimala temple was managed by them, and the rituals were performed by them. The community has alleged that the rituals in the temple have been ‘Brahminised’, and that the community was threatened and silenced if they dared to ask questions. Now, with the Supreme Court verdict allowing entry to women of all ages into the hilltop shrine, the Mala Araya community has found new strength, and say they will take their fight forward. Mala Araya, a term derived from the word "Malai Arayan", translates in Malayalam to 'King of the Hills'. The Adivasi community is one of the largest tribal communities in the state, with around 5,000 members residing in the hills surrounding Sabarimala. PK Sajeev, the founder and general secretary of Aikya Mala Araya Maha Sabha (AMAMS), an organisation working towards the welfare of the tribe, has researched extensively on the subject of the Sabarimala temple. Sajeev says that Lord Ayyappa, the presiding deity at the Sabarimala temple, was born to Kandan and Karuthamma, an Adivasi couple belonging to the Mala Araya tribe, in a cave in Ponnambalamedu near the Sabarimala temple. "The Cholas were on the offensive in Kerala during this period, and there was the Chera and Ay dynasty ruling in Travancore. Kandan and Karuthamma, who belong to the Mala Araya community, went to a priest called Korman to ask him for a solution to defeat the Cholas. Korman told them to fast for 41 days, and they will get a son who will defeat the Cholas. After 41 days, Lord Ayyappa was born in a cave in Ponnambalamedu," says Sajeev. According to Sajeev, the Mala Araya tribe stood with Ayyappa and helped fight the Cholas. "Ayyappan united the people who trained in martial arts in the region and formed a strong community,” he says. The Sabarimala temple is believed to have been established in the 12th Century. Since 1950, the temple has been under the control of the Travancore Devaswom Board (TDB). 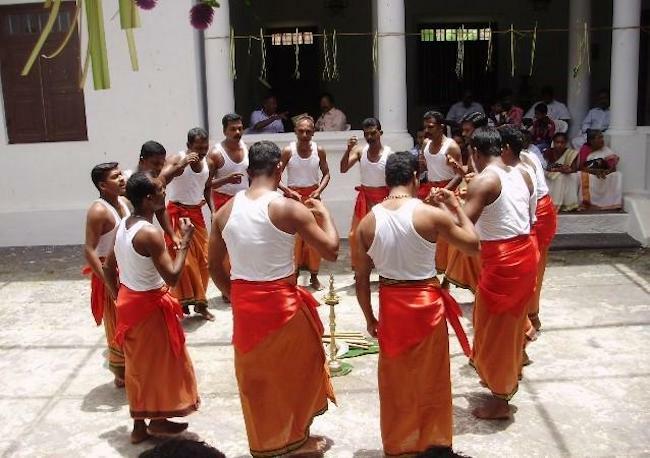 According to Sajeev, since the construction of the temple until the 19th century, it was the Mala Araya community that performed the rituals at the temple. When the Pandalam family ruled the region in the 1800s, the Adivasi community faced violence from the rulers, Sajeev says. The Mala Arayas were driven out of their homes in the hills, and had to flee elsewhere to protect themselves, he says. In the 1900s, the Pandalam family visited the temple and brought along their own priests from the Brahmin Thazhamon Madom family – popularly referred to as the ‘thantri family – says Sajeev, and that’s how the family got control of the rituals at the Sabarimala temple. Since then, the role of the head priest at the temple has been passed on within the Brahmin family. "There are various temples surrounding Sabarimala including in Karimala, Nilakkal, Ponnambalamedu, Thalappara, Anaimala. They were all temples managed by the Mala Arayas, but they are all destroyed and are in a bad state now. These temples were left to die so that all traces and evidences of the presence of Mala Arayas could be wiped off and new tradition and rituals could be introduced," Sajeev says. The Sabarimala temple, however, already had followers believing that the temple was sacred, says Sajeev. "The Pandalam royal family took over the temple by force from the Mala Arayas. They didn't take the other 18 temples in the area. but the rulers of Pandalam took over this temple and effectively sidelined the Mala Arayas," he says. This birth story of Ayyappa, Sajeev says, is the reason behind the 41-day fast observed by Ayyappa devotees. He further states that the 18 steps leading up to the temple's sanctum sanctorum, that are considered sacred, are a dedication to the 18 hills surrounding Sabarimala. "By crossing all 18 steps on the way to the shrine, it is a symbolic tribute to the 18 hills in the area". “Before the temple was Brahminised, the Mala Arayas would perform the thenabhishekam (bathing the Ayyappa idol with honey), which was replaced by the Neyyabhishekam (bathing the Ayyappa idol with ghee) by the Brahmin priests,” Sajeev says. Sajeev says that the Mala Arayas also performed the lighting of the Makara Jyothi as a ritual at the shrine. It is these rituals that the Adivasi community wants restored to them. However, in 2016, Rahul Easwar, the grandson of Sabarimala Thantri, filed a petition before the SC/ST Commission on behalf of deity to restore the rights of Mala Aryans to light the makaravilakku. The Thantri family however has denied that the tribes had any other rights over the temple. For the Mala Arayas, the Supreme Court verdict regarding women’s entry into Sabarimala has come as a shot in the arm – although the community itself stands divided on whether women between the ages of 10 and 50 should enter the temple. The AMAMS and the Aikya Thiruvithamkoor Mala Araya Maha Sabha (ATMAMS), another organisation working for the welfare of the Mala Arayas formed in the 1950s, are planning to file a petition in the Supreme Court seeking the restoration of the tribe's rights at the Sabarimala temple and three other shrines under the control of the TDB – the Karimala, Ponnambalamedu and Nilakkal Mahadeva temples. However, the petitions from the two organisations differ on one point – the issue of the entry of women. The ATMAMS believes that the practice of disallowing women between the ages of 10 and 50 entry into the Sabarimala temple should continue. "As we are asking for rituals and traditions to be restored at the temple, the practice of barring women in the menstruating age group should continue,” says KK Gangadharan, general secretary of the ATMAMS. In contrast, the AMAMS does not want to question the Supreme Court's decision to allow women of all ages entry into the shrine. "If a woman in the menstruating age group goes to the temple, it must be due to her devotion to Ayyappa," says Sajeev. But the two organizations are in agreement over their demand for the restoration of the rights of Mala Arayas at the temple. "We believe that our ancestors used to perform rituals in the temple and all we are asking is for those rituals to be restored again,” reiterates Gangadharan. The two organisations want the Archaeological Survey of India to conduct a survey and collect evidence to trace the involvement of the Mala Araya community in the temples in the areas surrounding the Sabarimala temple. "Our community was innocent with no one to protect our ancestors at the time. They were forced to stay away from the temple then. But now we have the Constitution and laws to protect us," Sajeev says. As the Mala Arayas are preparing for a long legal battle, the Pinarayi Vijayan-led Left Democratic Front (LDF) in power in the state has backed the tribe over its claims. Interestingly, the BJP, while continuing to support the agitation to protect the customs of the temple, will also be supporting the Mala Arayas’ claim. "We will support the Mala Araya tribe in reclaiming the rights lost after the formation of the Travancore Devaswom Board,” says PS Sreedharan Pillai, the state president of the BJP in Kerala. The two organizations leading the fight for the reclamation of the rights of the Mala Arayas are unconcerned about the motives of the political parties supporting their claims and are only eager to ensure that the members of their community to be able to perform rituals at the temple. "We will not attach ourselves to any party. We are simply working for the welfare of the Mala Araya tribe," says Sajeev.